Jeremy's six-year-old died in the Sandy Hook massacre in 2012, yesterday he was found dead. Jeremy's six-year-old died in the Sandy Hook massacre in 2012. Yesterday he was found dead. The father of a six-year-old girl killed in the Sandy Hook Elementary School massacre has died, apparently by suicide, days after two survivors of another mass shooting took their lives. Jeremy Richman, 49, was found on Monday inside a Newtown event centre in Connecticut where he had an office. 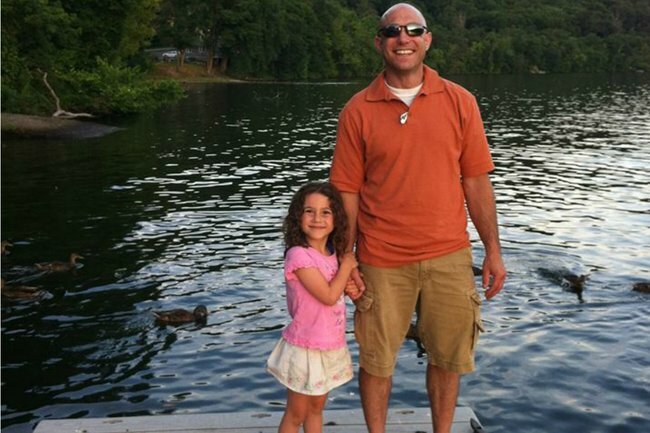 His daughter Avielle was murdered alongside 20 other children and six adults, in 2012. After the Florida shooting last year, survivors spoke out against the NRA. Watch below, post continues after video. “This is a heartbreaking event for the Richman family and the Newtown Community as a whole, the police department’s prayers are with the Richman family right now, and we ask that the family be given privacy in this most difficult time,” Leiutenant Aaron Bahamonde said in the statement. The Sandy Hook families’ grief has been compounded by the publicity and conspiracy theories surrounding the tragedy. Mr Richman was one of the relatives suing Infowars host Alex Jones for saying the Newtown shooting never happened. Mr Jones has repeatedly alleged on his radio and online show, that the massacre was a hoax made up by the government. “Every day you get up you expect to get punched in the chin with something,” Mr Neil Heslin, whose son Jesse was also killed, told the Hartford Courant. “He was a broken hearted person as we all are. I know Jeremy struggled,” he added. Mr Richman was a neuroscientist who was studying the human brain and exploring whether there are neurological signs that predispose people towards violent acts. Alongside his wife Jennifer Hensel, he’d also started The Avielle Foundation raising money to provide grants for neurological research. He leaves behind his wife and daughter, Imogen. In Florida, days before Mr Richman’s death, two survivors of the Parkland school shooting died by suicide. Sydney Aiello took her life on March 17, another male sophomore who hasn’t been identified died eight days later. Sydney’s grieving mother told CBS Miami her daughter couldn’t outrun the survivor’s guilt and the emotional trauma left by the slaughter last year. On Valentine’s Day 2018, Nickolas Cruz opened fire on the school leaving three adults and 14 students dead, including Sydney’s close friend Meadow Pollack. If this article has been triggering for you, please contact your general practitioner or in Australia, contact Lifeline 13 11 14 for support or beyondblue 1300 22 4636.